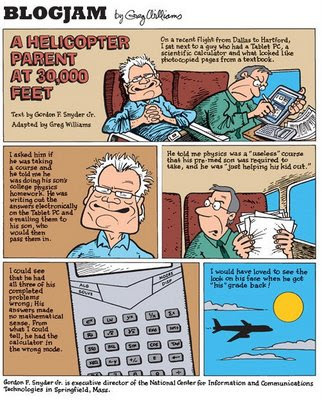 Blogjam cartoonist Greg Williams, who works for The Tampa Tribune and TBO.com, has taken a blog I wrote titled A Helicopter Parent at 30,000 Feet and produced it as a comic. Greg does some fun stuff with content based on contributions from readers, bloggers, and established writers and performers. The online version is linked here and there's also a direct link. The comic will appear in print today in the entertainment section of Tampa Tribune.